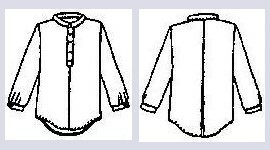 Boys old-style shirt with stand up collar, front placket, and inverted rear pleat. Choose one size: Boys S, M, L, or XL. From Friends Patterns.